Construction on the new Mississippi River bridge project is about to gain significantly increased visibility over the coming spring and summer months. During the winter, construction crews poured the bridge’s foundations. With that work recently completed, work has begun on the bridge’s towers which will slowly rise 400 ft into the air. The towers will take approximately 18 months to complete barring any delays from the rising Mississippi River. Meanwhile, work continues on the project to rebuild and reroute Tucker Blvd from Washington Ave to the new Mississippi River bridge ramps at Cass Ave. From MLK Dr to O’Fallon St, workers have already completely filled in the tunnel with dirt and Styrofoam that was used by the Illinois Terminal Railroad. North of O’Fallon St, construction has carved a curving dirt path through the site of an old Schnucks in order to connect Tucker Blvd directly to the new Mississippi River bridge. The old connection to from Tucker Blvd to N 13th St and N Florissant Ave will continue to exist through a new ‘T’ intersection near O’Fallon St.
Work on the segment of Tucker between MLK Dr and Washington Ave will commence once all work to the north has been completed. When finished, Tucker Blvd will have been transformed from an underutilized six-lane asphalt monstrosity to a saner four-lane street with a tree lined median. Renderings of the new Mississippi River Bridge and approach ramps connecting to Tucker Blvd. // MoDOT. Now, with Tucker Blvd about to gain a new purpose in its life—connecting Downtown to Illinois—I thought it would be interesting to go back and see how this north-south arterial came into being. The combination of streets St. Louisans know today (or knew prior to construction) as Tucker Blvd, Gravois Ave, and N Florissant Ave did not exist a century ago. The formation of this important St. Louis arterial was the product of many factors that began to manifest themselves in late 19th century St. Louis. As the population and stature of St. Louis rose, traffic congestion became a pressing concern downtown and across the city. Early in the 20th century, the city conducted a number of studies looking at how best to manage and encourage the explosive growth it was experiencing. To help with the congestion problems, St. Louis undertook a number of extensive street widening projects, particularly in the downtown area. Streets that were widened included Washington Ave, Locust St, and Olive St.
Traffic studies, conducted by none other than famous city planner Harland Bartholomew, showed a disproportionate number of people entering the central business district from the west (51% of vehicles and 47% of streetcars) compared to the north and south despite the city’s population being rather evenly distributed. At the time, St. Louis lacked a decent radial arterial street leading into the CBD. In fact, Broadway was the only north-south street that passed through the CBD and extended for some distance on either side. Most traffic that found Broadway too inconvenient to reach instead used Grand or Jefferson before proceeding east into downtown. And thus the north-south combination of Tucker Blvd, Gravois Ave, and Florissant Ave was born out of the need to better connect the north and south sides of St. Louis to downtown. Map of St. Louis in 1916. // Missouri History Museum. The 150 ft width of Tucker Blvd nee Twelfth St between Market St and Washington Ave on the edge of the CBD made it a natural starting point for a new arterial road. On the south side, the new Twelfth St would widen a path to Chouteau across the then new viaduct over the Mill Creek valley. 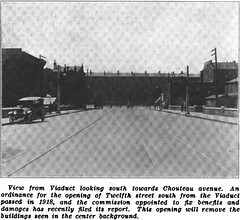 Buildings were then torn down between Chouteau Ave and Park Ave and between Geyer Ave and Russell Ave in order to reach the important arterial of Gravois Ave. Finally, large portions of Gravois Ave between Grand Ave and Park Ave were increased in width from 60 ft to 100 ft.
To the north, Twelfth St was extended roughly by way of 13th St, Mullanphany St, and 15th St and given a uniform width of about 100 ft. And by way of 15th St (this portion since renamed to N Florissant Ave), the new Twelfth St would connect with the intersection of both Natural Bridge Ave and Florissant Ave.
Around 1932, the Illinois Terminal Railroad completed digging a commuter and freight line underneath Twelfth St. The railroad ran an electrified commuter line from Alton, Edwardsville, Granite City and other Metro East communities across the McKinley Bridge to a congested street-level station near downtown. The tunnel was built to avoid the congested city streets and bring passengers to a station closer to Washington Ave. Twelfth St was rebuilt on a viaduct above the rails. Attracted by the new railroad, the Globe-Democrat moved into a new building adjacent to the tracks. Rail commuters utilized a station built into a building two blocks south at 710 N Twelfth St which also served as a freight warehouse for the Illinois Terminal. One year after commuter operations ceased in 1958, the Globe sold it’s building to the Post-Dispatch and moved into the Illinois Terminal’s building. The Globe-Democrat folded in 1986, but the building is still known as the Globe Building. Finally, in 1979, Twelfth St was renamed to Tucker Blvd in honor of former mayor Raymond Tucker.